Nonfiction, Adult Trade Paperback, Food Writing. Paper, 8.5 x 9, 288 pages with index. Printed on 100% post-consumer recycled paper. You probably have a childhood memory of biting into a ruby red tomato and having the taste explode on your tongue, yet the things they call by the same name in the grocery store today are insipid mush. Perhaps you get a knot in your stomach when you read about America’s epidemics of obesity, heart disease, high blood pressure, and diabetes. You’re also aware that we’ve got even bigger problems looming: the way we’re living is messing up our atmosphere, wrecking the fertility of our soil, and polluting our water and air. Could all these problems have anything to do with the way we produce our food? There is this whole other food system that has been quietly producing delicious food in ways that not only don’t wreck any ecosystems but actually improve some of them. These are the foods lovingly produced by small-scale farmers and family-run cottage businesses, not corporations. They’re made in small quantities close to your community by people who cherish their land and work hard to keep it healthy. Millions more Americans would love to eat this bounty, but many worry that eating fresh, local food is too difficult or expensive. All we need is a boost in confidence…and a little practical know-how. 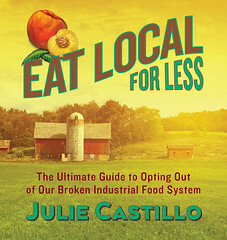 In Eat Local for Less, Julie Castillo offers down-to-earth advice on finding, buying, growing, and preparing great food from local sources. A great resource for anyone concerned about animal welfare, economic fair play, family cohesion, community wellbeing, or the impact of human activity on the environment, Eat Local for Less shows readers how to bring what’s on their plates in line with what’s in their hearts. You really can derive more pleasure from meals, enjoy better health, experience a deeper connection with nature, nurture a robust local economy, and support a fairer world—simply by sitting down to a deliberately chosen, lovingly prepared meal. Eat Local for Less can be your roadmap to that meal.